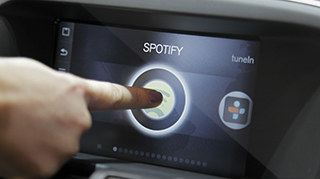 A potential conflict of interests is looming between the advanced driver aids which are making cars less likely to have an accident, and the sohpisticated infotainment and connectivity features which threaten to distract drivers. There are fears that, as cars become more capable of driving themselves, drivers could divert their attention from the road to the connectivity options open to them. Already cars can automatically keep their distance from those ahead, prevent drivers from changing lanes into the path of other vehicles and brake autonomously to avoid accidents with cyclists and pedestrians. Soon they will be able to stop drivers from pulling out at intersections and roundabouts if there is a risk of a crash, and next year Volvo will introduce systems which can read verges and barriers to prevent cars from leaving the road, automatically avoid low-speed accidents at night, follow road markings and minimise the speed of collisions with large animals. Yet at the same time cars are becoming just another connected device like a smartphone or tablet computer. Through smartphone apps or embedded systems they have already become extensions of the home or office, giving drivers access to e-mails, share prices, news feeds and social media. Ever-larger monitors provide highly realistic navigation guides. It is also possible to tune into internet radio stations all around the world, and even find and book hotel rooms or tables at restaurants. The insurance company Allianz claims that 10% of all accidents in Germany are due to driver distraction, while Europe’s largest automobile club – the German-based ADAC – cites tuning the radio as the biggest single factor in diverting the driver’s attention. In America the National Highway Traffic Safety Administration wants laws to ban any infotainment task that takes more than two seconds to complete, while the UK will increase fines for using a hand-held mobile phone while driving by 50% to £90, and also outlaw eating a sandwich or lighting a cigarette behind the wheel. Candido Peterlini, the infotainment manager within the product planning section of the Fiat Group – which has connectivity systems in Chryslers, Jeeps, Ferraris and Maseratis – believes that one way is to monitor driver behaviour. “Today we can do it for economy driving. In future we can maybe monitor it for safety,” he says. Cars could be fitted with a box which calculates the driver’s “risk index”, and the safest could be rewarded with lower insurance premiums. Harman, the global market leader for automotive connectivity and infotainment systems, is working on ideas which will allow drivers to perform more tasks without taking their gaze from the road or letting go of the steering wheel. Already its systems include advanced voice control which can convert text to speech and vice-versa. 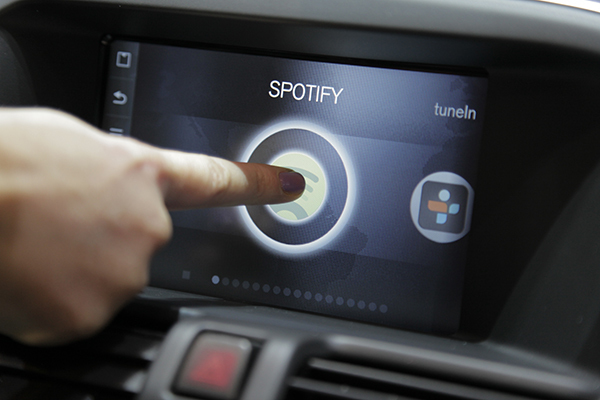 By the end of the decade it expects nearly four million cars in Europe to have this feature. It is also working on gesture recognition, allowing drivers to perform simple tasks with a move of a hand or finger, and has developed a next-generation head-up display which beams safety information as well as navigation instructions and road signs onto the windscreen in the driver’s eye-line.